Port Canaveral isn’t the most convenient port for cruise passengers. While other Florida ports such as Miami are close to the airport, Port Canaveral is about 45 minutes from Orlando International. That means cruise passengers sailing from the port have to figure out transportation to the port before they can set sail. Because of the distance, many people elect to drive to the port. Of course, if you plan to drive then you will have to also figure out parking. Parking at Port Canaveral is expensive. Rates run at least $17 per day at the cruise terminal. However, there is a cheaper way to park. If you plan to stay in the area the night before your cruise, many area hotels offer parking packages. Stay a single night and they will let you park your car for free or at a much lower rate than what it costs to park at the port. In addition, the hotel will often provide transportation to the port. In all, the costs savings versus parking at the port can be hundreds of dollars, depending on the length of your trip. The list below isn’t meant to be exhaustive, but rather a starting point for many of the hotels in the area with park and cruise deals. If you have a hotel in mind not listed below, call and see if they offer cruise parking. Rates are for a recent search for a Saturday night stay and will vary. Click on each link to read reviews from TripAdvisor. For parking packages you may have to book through the hotel website, which is linked on TripAdvisor. More Hotel Ideas: You can also click here to see hotels near Port Canaveral (potentially without parking specials) or see hotels with shuttles in the port area. An affordable option located on the mainland about 15 miles from the port, the Budget Inn offers free parking during your cruise. Shuttle transportation is available for an additional charge. The Comfort Inn is located about 6.5 miles from the port and just steps from the beach. For the price you get a night’s stay, parking, plus roundtrip transportation included, at a rate that’s about the same as parking at the port for a week. Located just a block from the beach, this Best Western is in the heart of Cocoa Beach with tons of activities within walking distance. Meanwhile, their parking package includes round-trip shuttle to your cruise ship (additional charge for more than two people) and included parking while you are away. One of your cheapest options, America’s Best Value Inn is a great option if you want to save some cash. For as little as $75 per night you can park your car for free for up to two weeks. The hotel is located in Cocoa, on the mainland so it’s a few miles to the beach and the cruise port. If you want close to the cruise port, this is it. In fact, you might be able to catch a glimpse of the ships cruising in and out of Port Canaveral. The parking package includes parking for one vehicle and shuttle transport roundtrip to and from your cruise. Homewood Suites offers a location that’s right near the cruise ports — just a couple of miles away. 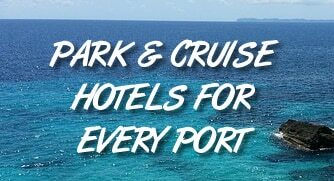 In addition they offer a “Park, Stay, and Go” package with cruise parking for up to 7 nights along with transport to and from your cruise. Stay at the Radisson and you’ll be only 2.5 miles from Port Canaveral. The Park & Cruise package includes a shuttle to and from the port for two people along with free parking while you sail. This Holiday Inn Express is in the heart of Cocoa Beach and just a couple of blocks from the city pier where there are lots of attractions. Rates are reasonable and the parking package includes overnight stay, parking, transportation to the port, and free breakfast and wi-fi. La Quinta Inn is south of the busiest part of Cocoa Beach. If you select the parking package, you’ll receive a night’s stay and free parking during your cruise, plus transportation back and forth from the port. Breakfast is also included. Located right in the heart of Cocoa Beach, the Four Points is walking distance to parks, restaurants, the beach, and the famous Ron Jon Surf Shop. Stay one night with their cruise package and you’ll get parking for the duration of your cruise plus a shuttle ride back and forth from the port. Prices for the package run just about $30 more than regular rates. It’s hard to beat the location of this hotel, and the parking package makes it even better. When we called to ask about parking, we were told that visitors booking at the standard rate (meaning no discounts or special offers) can park their car for free during the cruise. You will need to pay $7 per person for a shuttle to the port (and back), or catch an Uber/Lyft to and from the port. In the heart of Cocoa Beach (right near the pier), the Days Inn has a Stay & Cruise package that we found for about $40 more than the base list price. For that extra cost, you get parking during your cruise, plus round trip transportation to the cruise terminal. The Residence Inn is one of the closest spot to the cruise ships and one of the highest-rated hotels in the area. That combination makes it an obvious choice for many cruise passengers. If you need to park, they offer a “Park and Cruise” package that includes parking and a round trip ride to the port. The rates for the package are about $50 more than the standard rate, meaning you can pay only a little more to park for the week. Consider that parking at the port costs $17 per day, or about $120 for a week cruise. The Quality Inn offers up a Park & Cruise package that includes your parking and round-trip transportation to the cruise ship. The base room rate is about $170 in our search, and we found the parking package for $214. While rates will change, that’s a $44 difference for parking during your trip. If you are taking a week cruise, that’s much cheaper than the $17 per day that the port charge. The Motel 6 in Cocoa Beach is an affordable option for those who want to stay in the heart of Cocoa Beach without spending a fortune. If you are driving and need to park your car during your cruise, it’s a simple $5 per day to park your car and only $7 per person to take a shuttle to the cruise port. It’s hard to find a cheaper deal than that. For a great all-around hotel, it’s hard to beat Hampton Inn. The well-known hotel offers up a Park & Cruise package for $280 — or about $50 more than the base rate. This package provides parking while you take your trip and transport to the port for two people. With rates for a week of parking at the port costing about $120, the parking package here is a good deal.